A pond brings wildlife into your garden. It’ll bring insects and amphibians in as well as birds! It’ll be a lovely peaceful area in your garden. You could have a wildlife pond or a fish pond. There’s certainly more maintenance with a fish pond but you can have some amazing fish! A wildlife pond should have plenty of plants in and be of sufficient depth that frogs can hide in the bottom of it in the winter. That’s ideally at least 75cm – a 100 cm deep would be good too. It doesn’t need to be that deep all the way across, infact having a shallow slope at one end allows for different creatures to get into the pond and is perfect for tadpoles as they develope! A variety of plants should be put in too – some tall reads, some lillies and some oxygenating weed. You’re not supposed to take frogspawn from another pond but people do – leave your pond a year and you might get some naturally. It’s better if frogs find their own way to your garden because if anything happened to it then there are other ponds locally that could sustain them. There’s a pond liner calculator at pondkeeper to help you and tons of advice if you want a koi pond! PondKeeper have everything you need if you’re a beginner or an experienced pond keeper. 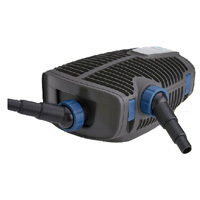 The best brands anmd best items of pond equipment. The Aquamax range is known worldwide for pumping polluted water into filter systems. This NEW version now boasts energy savings of up to 40% on the old model.